There’s now at least three different official possible options for reconfiguring College Green to make it more pedestrian friendly and that’s a long-over due idea. However, some of the space also needs to be allocated to cycling. The original but not final Luas Cross City plans suggest some minimal extra space given over to footpath — squeezing Dame Street-bound bicycles and buses closer together in a single lane. Transport planners in the National Transport Authority (NTA) were the first suggest a pedestrian plaza, on the south side of the street, with traffic cut down to one lanes in both directions (before and after images shown above). Today the wider public is learning that the Dublin City architects are suggesting a mirrored image of the NTA idea, with the plaza on the north side of the street, along the historic Bank of Ireland building. The Irish Times reports this morning that a trial of this arrangement may take place (as an aside: unlike what the article suggests, trams running in pedestrian areas is a non-issue. It’s done all over Europe). The number of DublinBikes bicycles — which are focused in the city centre — has been doubled and more expansion is likely sooner or later. The system is still relatively small but let long-term subscriber have shot up to 50,000 people and there’s no signs that that is leveling off yet. 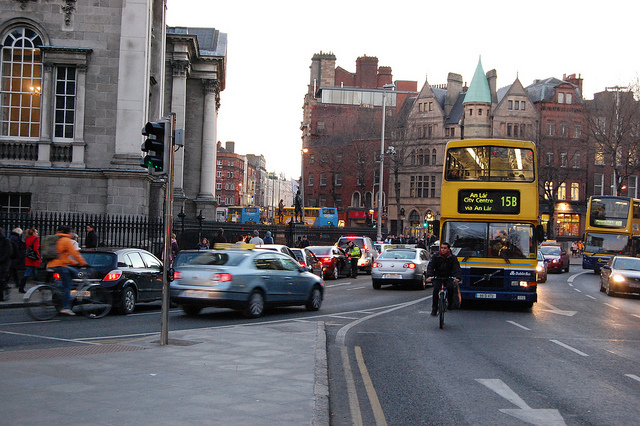 Hardly the vision for cycling in Dublin that we want? The changes may mean that there’ll be no cars, but there will be tram tracks to navigate, and reducing the roadway down to just one bus lane in each direction would put buses/taxis and bicycles into a crazy level of conflict. The experience of cycling on a single-lane street while holding up a bus full of passengers isn’t something that many current bicycle users are happy with. It’s not going to appeal to the growing numbers of less-harden “cyclists” (who often don’t see themselves as cyclists). Maybe a larger issue is that too many taxi drivers will brush past a person on a bicycle even where there’s no room to safely do so. There’s a few reasons Luas tram tracks due to be constructed on College Green should push the move for space for cycling, the main two: once the tracks are placed there’s little chance of them being removed and because tracks and bicycle wheels don’t mix well. Space for cycling can help with the latter issue — designing cycle routes around tracks needs to be carefully done. If there’s going to be two-way cycle paths on Westmorland St and College St, than this needs to continue at least onto College Green and into at least some of Dame St. This may cause horror in the minds of some traffic planners, architects and cyclists, but the mess of two-way paths not continuing will be far more frightening on a daily bases for all street users. Permeability for cycling in the city center core areais quite frankly disgraceful. It’s only to get worse. 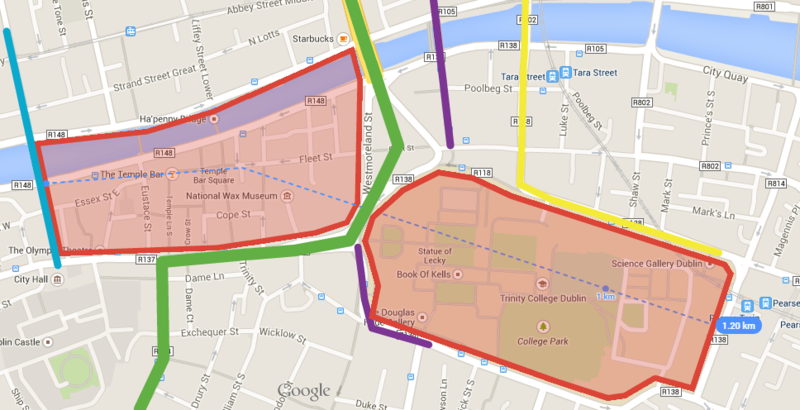 Luas Cross City will reduce future options and make some current options less attractive than they already are . As the map shows College Green (in green) splits two large areas (in red) each area more than 0.5km long and un-permeability to north-south cycling movements as well many movements on and off the quays. The one-way streets at the edges of the areas make permeability worse again (yellow for northbound only and blue for southbound only). Overall it’s not an easy issue to solve. But trying to solve it after Luas tracks are installed will be far, far harder. Let’s have a decent stab at it now. It is not very nice at the moment, heading south leaving College Street going round the bend at the Traffic lights to go pass the front of Trinity is very narrow lots of confrontations with those Buses and Cars. Then if you want to go up Dame Street you have to be careful of Traffic wishing to head for Nassaue Street. The same thing happens if you are heading North pass The Bank Of Ireland on College Green , you have to watch out for Buses wedging you in to the Path. The Traffic Planners seem to have a Mortal fear of Banning Traffic like Buses and Cars on this route. The best and safest solution with putting in Luas is to just ban those Buses and Cars from the area and have it for Pedestrians and Cyclists only. Cycling across this part of the city is often terrifying. Taxi and Bus drivers in Dublin as a whole have little regard for cyclists and seem to see them as a pest, this becomes apparent at this pinch point. Complete separation from other traffic would make cyclists feel safer and would represent our city as more progressive. I think John’s argument makes perfect sense. The road surface in the Trinity College area as it currently stands is pockmarked with pot holes. This is just to add to the general unpleasant cycling experience in the area. A major overhaul is required, but I doubt we will see it. Any improvement here should be for the benefit of pedestrians and public transport – I think general through traffic that has no business in the area and cyclists should be actively discouraged – in the city centre, the pedestrian is king! Sorry to disappoint you but that boat has sailed. While I agree with priority for pedestrians, the flawed logic of prioritising public transport while discouraging cyclists is startling. A walk down Dame St where buses speed aggressively inches from busy narrow pavements should convince anybody that public transport priority does not make pedestrians feel safe or comfortable. It should be clear that taxis and buses have far more to answer with regard to the discomfort and deprioritisation of pedestrians than cycle traffic does. A cycle around the curving pinch point at the Bank of Ireland on College green with either a taxi or a bus inches from your rear wheel might convince you of the disdain many professional drivers have for the safety of other road users and make you question how well they also mix with pedestrians regardless of the presence of bicycles. It has sadly come to the point that the biggest fault with any motorized transport is the human element – this needs to be removed as much as possible. The first step is ‘Black Box’ technology along with sat-tracking – the days of independent motoring are over – we also may get used to automated driving in the future. Most of you who Cycle or drive along this route will have noticed before you come to Bank of Ireland the big ridge along the middle of the road. A hill that is about 10 cm in height stretching for about 10 metres, I believe it is caused by the Buses constant use. Possibly when the Tarmac melts in Summer and is gradually wedged into a hill by Buses. Not very nice if you have to Cycle on it. I think the biggest problem is the Buses and Taxis driving very close to Cyclists, the ordinary drivers of cars are not quite as bad. Now it looks like we will have BRT / rapid Bus Transit service to contend with as well as the Luas line . There will be no room for Dublin Bus or Cars on this route.